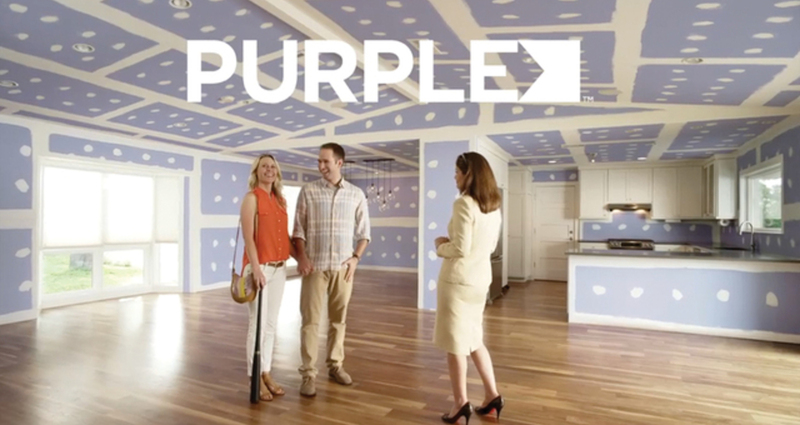 In this TV spot, a house-hunting couple gains a new appreciation for walls when their realtor leads a surreal home tour showcasing the strength, resilience and value of PURPLE drywall. Drywall is generally considered a commodity product with zero brand awareness. National Gypsum wanted to shift the entire category, moving the focus from its traditional core trade audience to homeowners. With a trademarked product color and a strong call to action (“Ask for Purple”), this spot provides education on the importance of choosing the right walls while keeping viewers entertained with the eye-popping possibilities that lie just beneath the paint. The deadpan magic of a realtor and her clients exposing entire chunks of wall presented a unique challenge for the production company. Shot in a real home, the spot required extensive CGI and visual effects to create an off-kilter environment where a baseball bat thwacks against drywall without making a dent, a bathroom wall peels back like a shower curtain, and every surface, angle and crevice of a contemporary great room is covered in purple drywall and white finishing compound. The message: Look at walls in a whole new way. The result: Mission accomplished.